A high energy, cardio Dance Fitness class- suitable for all levels that Burns, Tones and Shapes your body in all the right places. 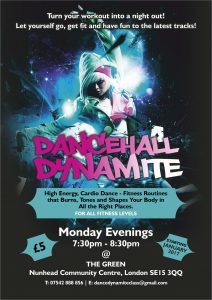 Let yourself go, get fit and have fun to the latest Dancehall tracks. Turn your workout into a night out!